You know 287(g), because we talked about it often here. This is the Homeland Security contract that sends money to untrained, unsupervised cops in cities and counties in different jurisdictions for them to act like they work for the immigration folks and scoop up undocumented immigrants. In most cases this has led to a mess of racial profiling cases, lawsuits by the hundreds, and liabilities that just won’t stop. A recent New Yorker article said that Maricopa County had paid more than $40,000,000 in claims on lawsuits based on Arapio’s reign of terror against anyone with brown skin in that sun scorched city. And, all of this has been sanctioned and sanitized by Napolitano, first as governor and apologist for Arpaio when she was in Arizona, and now as enabler while she is in DC. My companeros with the National Day Laborers Organizing Network (www.ndlon.org) are even picketing in front of the HBO studio today to demand the question be asked. Suerte to Pablo, Chris, and the gang for standing up now, so let’s do this thing. Obama gets it, but doesn’t seem to see the contraction. Yesterday in talking about the bust in Cambridge of a buddy, African-American professor Henry Louis Gates of Harvard, he could see it clearly, but he wasn’t looking far enough. “What I think we know separate and apart from this incident,” Obama stated of Gates’ controversial July 16 arrest, “is that there’s a long history in this country of African-Americans and Latinos being stopped by law enforcement disproportionately. That’s just a fact. 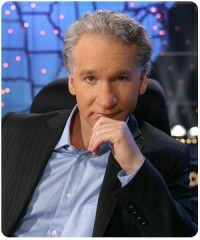 Bill Maher is not my personal piece of cake. He was in New Orleans recently and the rest of my tribe went to see him and thought he was great, so what do I know. I can’t get past the fact that he seems such a smart aleck, but whatever. He can still do the right thing here. Being a self-proclaimed liberal can’t be all talk. Eventually even a Bill Maher needs to take the smirk off his face and stand up hard. Let’s make him do it now! When we finish with Maher, next we will move to send the President the phone number for Napolitano. Maybe he could talk to her about this racial profiling problem and get her to do something about it. Maybe we could sent him a picture of her ID and remind the President that Napolitano works for him. This entry was posted in Community Organizing, immigration reform and tagged arpaiao, bill maher, homeland security, immigration reform, Janet Napolitano, Obama by wade. Bookmark the permalink.